Michal Shapiro is a visual artist whose work has been used most conspicuously in the TV series “Mad Men.” Her painting “Butternut” was used in Don Draper’s office at Sterling Cooper, and is practically iconic there. Other settings of her work can be seen in movies (“Away We Go,” “Trumbo”), commercials and TV shows. She attended Queens College to acquire academic skills in Art. 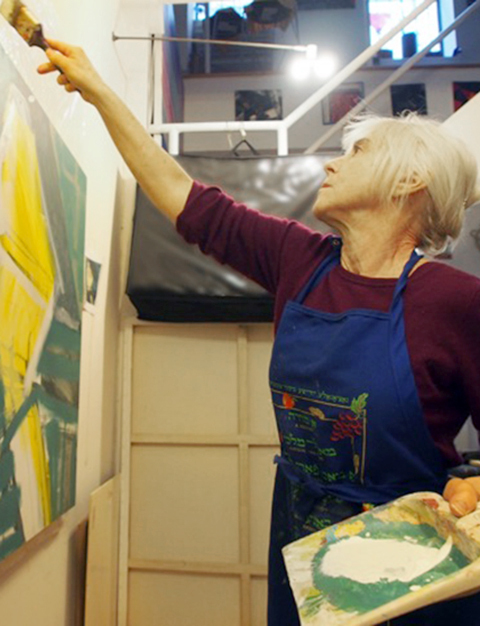 At that time, the faculty of the QC art department was focused on figurative art; however professors Herbert Aach and Gerald Hahn were influential in her transition into abstraction. This solidified in the late 70’s through her exposure to the various painters she met in the then flourishing Soho scene, most prominently, Thornton Willis. Michal Shapiro is also a musician, and world music journalist with a videoblog on artsjournal.com, her own YouTube channel, as well as her site worldmusicandculture.com and Vimeo.